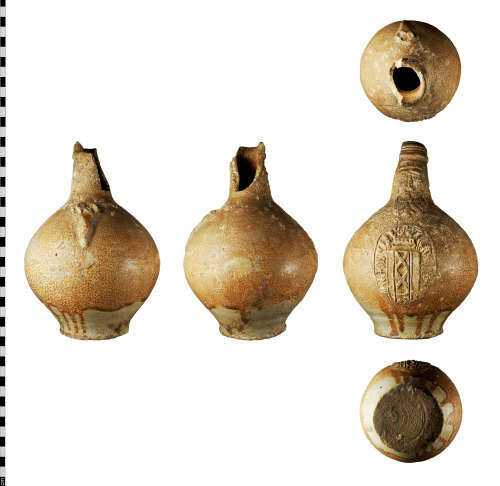 A post-Medieval stoneware Bellarmine jug (also known as a Beardman/Bartmaan jug). The body of the vessel is sub-globular, with a flat base and conical neck (damaged). A speckled brown glaze covers most of the surface of the vessel, running into the lower quarter, which is off-white. The typical moulded human mask is situated at the junction of neck and body; it has a ladder-like mouth, 'flower pad' moustache and corded beard. Below this, occupying the centre of the body, are the arms of Amsterdam. A stub of the handle base is visible on the reverse, located at the top of the body. A number of concentric arcs on the base attest to the use of wire to remove the pot from the wheel. Height: 200mm; width: 130mm. Weight: 782.4g. A vessel with similar mask and arms, made at Frechen, is illustrated by Hurst et al. (1986: 220). The arced grooves on the base of this vessel are also diagnostic of Frechen stoneware (ibid. 214). This jug probably dates from the 17th century.